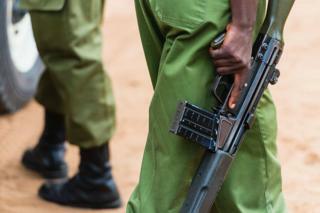 Kenyan police have fired warning shots at anti-corruption officers to help two colleagues accused of bribery to escape from detention, Kenya's Ethics and Anti-Corruption Commission (EACC) said. The detained officers were being investigated for allegedly demanding a bribe from a foreigner, EACC added. Police have not yet commented on the allegations. The two suspects, who work for the Directorate of Criminal Investigations, were arrested in the capital, Nairobi, on Wednesday evening. The officers had been handcuffed "but were rescued by their colleagues from Kabete Police Station who fired several rounds of ammunition as warning shots to facilitate the escape", the EACC added on its Twitter account. A manhunt has been launched for the suspects, it said. That seems like a swipe at the anti-corruption commission, which announced last month that it intends to use the Bible to deter theft of public funds.